Lee Kum Kee held a cooking competition for bloggers in April. To my knowledge, it’s the first one ever run in Hong Kong before. I felt honoured to be invited and created a demo recipe for their official site. Healthy, creative and fusion were the requirements and themes for every entry. So here you go, I translated my demo recipe into English to share the joy of participating something significant in food blogging. What else could be more healthier than a steamed fish dish? Believed that this dish had nailed the competition themes, off I went to submit my recipe and posted on my chinese food blog. By adding a bit of vietnamese condiment, fish sauce, into the fish paste, I planned to bring in a kind of cross-over-taste in Chinese traditional seasoning. Besides all the cooking, I was able to know and connect more Hong Kong food bloggers through this event, as well as expand my blogging horizon a bit. 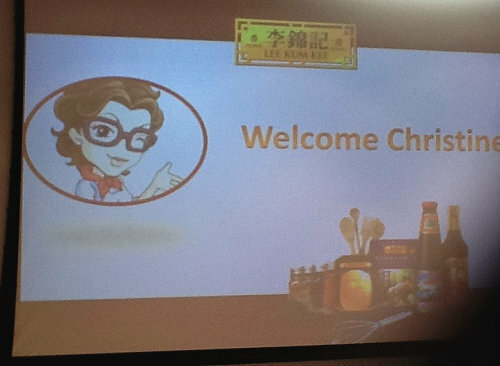 As a side note, I was invited to visit the LKK headquarter during my trip back to Hong Kong last month. Very impressed by their giant, modern kitchen. 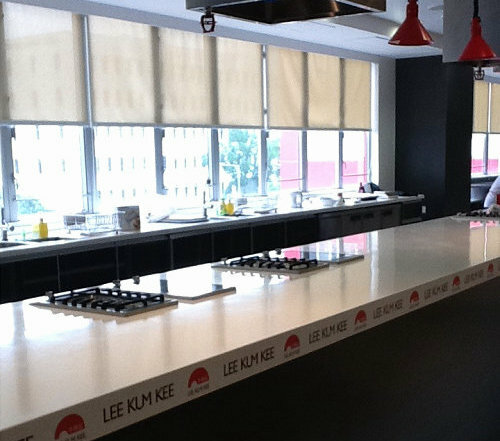 I could imagine how excited the contestants would have felt while cooking their invention dishes in this splendid kitchen. Prepare 8 chinese tablespoons or cook in batches. Damp 8 chinese tablespoon (as picture shown above) with a bit of water. Divide fish paste into the tablespoons and make 8 oval shapes. 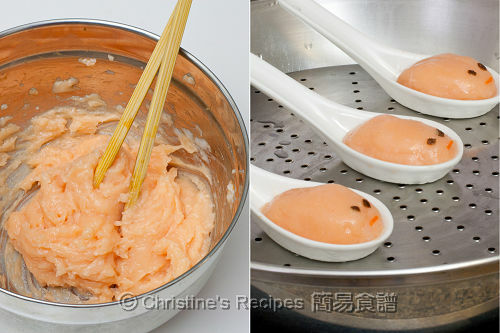 On each fish paste portion, carefully place two diced mushrooms as fish eyes, one tiny strip of carrot as fish mouth. Steam in a wok over high heat, about 5 minutes, or until cooked through. Run a sharp knife around each tablespoon and remove the fish cakes. Arrange on a large serving plate. While steaming the fish cakes, use a small saucepan, cook the sauce over medium heat. When it boils, add the thickening and cook to preferred consistency. Set aside. Add a dash of oil in boiling water in the wok, briefly cook the baby bok choy until soft and turns green. Don’t overcook them. Drain them, and cut away the stalks. 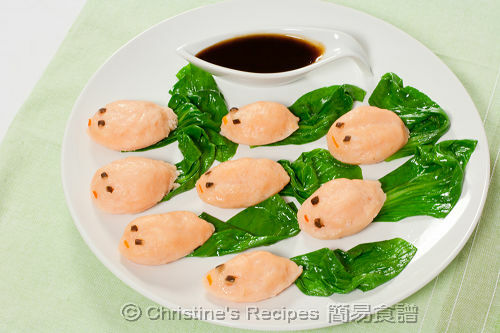 Place each leaf next to each fish cake as its tail. Serve hot with the sauce. Carrot is a healthy ingredient. Utilize its natural golden orange colour to replicate the look and colour of a golden fish in order to enhance the appetite. When it comes to making this fish cake, only use fish meat, without any fish skin, as you don’t want the fish cakes get some black spot inside. It’s much more easier to get the colour you like if you add carrot juice bit by bit, and stir at the same time. When shaping the fish cake, you might find the fish paste a bit sticky or messy. No worries. To make it workable, damp your hands with a bit of water, you'll find shaping a fish cake is a piece of cake. Cook the bok choy with stalks intacted, it helps to drain out easily without tearing off the delicate leaves. The stalks can be eaten with sauce anyway, you won’t waste anything. When serving this dish, the sauce can be transferred into a small sauce pot. Fantastic creation, Christine!! They look so cute and healthy!! You're going to be LKK's ambassador soon. wow Congratulations Christine! You definitely deserve it. 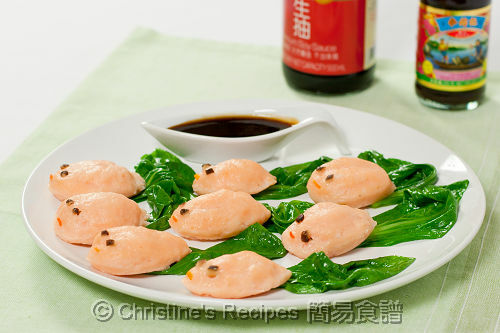 I can see gold fish in your creation:D Very lovely and healthy too! A wonderful dish that i will try in my kitchen asap! how wonderful is that to be invited for the demo! you are a great inspiration! Congrats Christine! And I have never seen such pretty fish cakes! So restaurant-worthy! Congrats Christine!! You sure deserve it! I just love your fish....so pretty! Looking at them makes me smile :D Hope you have all the fun everyday. Congrats on this achievement! Your dish looks lovely...i really like your presentation. It's very stylish! Wonderful presentation! An interesting recipe indeed, not to mention that it is a healthy treat. No wonder you are welcomed as their VIP : )! Congratulations. Have you thought about entering the Masterchef competition?? Wonderful and lovely presentation! You have a great talent! Congratulation, Always love your recipes.